African American voters mobilized in part by the NAACP, turned out in huge numbers and played a decisive role in a special election, which elected the first Democratic Senator in Alabama in decades. ?The African-American community played a major role in this most-crucial special election,? said Derrick Johnson, NAACP President and CEO. ?Our vote is reflective of the values of a nation refusing to exchange its integrity and character for the sake of selfish partisan politics. As a native Alabamian said, Black Folks saved the soul of Alabama. This vote shows that unifying politics, coalition-building and inspirational rhetoric can win in the South. Alabama State Conference and Branches, working with the NAACP?s national office and partners throughout the nation, was able to make over 40,000 calls to voters throughout the state and persuade them to exercise their right to vote.? The Alabama State Conference and partners conducted an unprecedented texting campaign that reached nearly 160,000 African-Americans and women throughout the state. ? 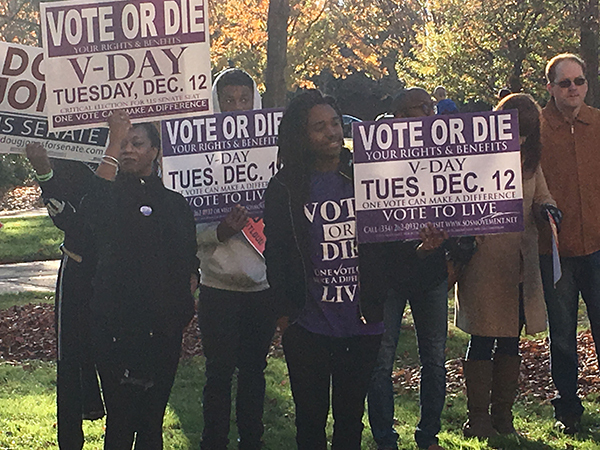 ?Of the voters reached, over 90 percent informed the NAACP that they would go to the polls and vote. ?We knew it would be a hard fight to mobilize voters, but we also had an idea of the consequences if the Black vote in Alabama stayed silent,? said NAACP Alabama State President Benard Simelton. ?Those of us who know the history of Alabama with its Jim Crow and segregationist attitude, understand the importance of the vote and why not only have we got to ensure that we use it, but that we continue to protect it from any attempts at suppression,? added Simelton. In the special election, Democrat Doug Jones garnered a reported 49.9 percent of the vote compared to 48.4 percent for Republican challenger Roy Moore to win the seat vacated by former Senator and current U.S. Attorney General Jefferson Sessions.